When it comes to lawnmowers, most owners don't perform any type of engine maintenance at all. And while it's true that the engine inside your lawnmower is generally basic in nature, just like all machines, it needs attention to keep it running smoothly and efficiently. With products available for owners of all engine types to perform their own synthetic oil change, TenEyck Distributing has knowledge on how to keep all engines running at their best. 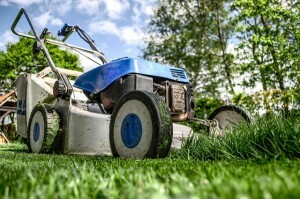 To help get you started, this post is a checklist which all lawn mower owners can use to keep their mower in good working order and performing better, for longer. With your lawnmower turned off and the spark plug removed, safely raise it up and clean the blades and operating mechanics. Grass and debris can quickly accumulate on the blades and reduce their ability to cut cleanly. Additionally, if enough debris accumulates close to and around the mechanics, it can restrict the ability of the blades to turn efficiently. Keeping your blades clean is the first step to maintaining them. Once again, ensure the mower is switched off, and you have removed the spark plug before turning your lawnmower on its side to thoroughly inspect the condition of your blades. If there are any cracks or dents present, it is best to replace them before your next cut. If they are just blunt, but otherwise in good condition and you have the right tools, sharpening them will help you get a cleaner cut. Check your owner's manual for the recommended replacement frequency, usually about 50 hours or cutting time, and keep to it. Similar to the oil in your car, the engine lubricant in your lawnmower can become aged and require you to give it a synthetic oil change. The key is to use the right product, so make sure you don't just use the same one from your car. There are a number of engine lubricants available for 4-stroke oil engines, but the best are AMSOIL synthetic oils. Speak with TenEyck Distributing at (208) 589-4660 about the make and model of your lawnmower to get the right product to perform a synthetic oil change. While it only has one, your lawnmower isn't going to start without a spark plug. Briggs and Stratton suggest that you change your spark plug around every 100 hours. If your mower is becoming difficult to start and your spark plug has seen better days, it's time to replace it. For safety reasons, when replacing your spark plug, it's important to ensure that your mower is on the ground with the blades facing the grass, and replacing the spark plug is the last item of maintenance that you do before operating your mower. Whether you have a foam based or a paper-based air filter, the dust and small pieces of grass that your lawn mower throws up can cause your air filter to become clogged, restricting the amount of air that the engine can take in. If you are using a foam air filter, you can remove it from your engine and clean it out with detergent. If you have a paper-based air filter, and it has become clogged, you'll need to replace it. If you only use your lawnmower during the summer season, and then store it until the sun decides to show itself again, how you store it can determine how well it performs next season. Before you store it away, be sure to give it a thorough wash and wipe down until it is completely dry. Again, with the spark plug removed, tip your mower over and empty the fuel in an appropriate catchment vessel. If it gets particularly cold, find a moisture resistant covering and store your mower in a dry place. Similar to your car's engine, the higher the quality of motor oil you use, the better the performance you will see from the engine, no matter which vehicle it powers. To increase the performance of your lawnmower engine, give it a synthetic oil change around every 50 hours as mentioned above. Not all synthetic engine lubricants were created equal, and this applies in particular when it comes to a 4-stroke engine. Don't use the same synthetic oil in your car for your mower. Speak with TenEyck Distributing at (208) 589-4660 before you empty your oil and get a high-quality and purpose designed 4-stroke synthetic oil that suits your mower.